Messrs. W.W. Sampson & Son; Christie's, London, 4 April 1930, lot 19 (30 gns. to the grandfather of the present owner). She strikes! she groans! the yawning rent appears! Whilst o'er her pride the sea, its crest triumphant rears. In the present watercolour the crags, mother and lifeboat are clearly visible and relate directly to the engraved version (W.G. Rawlinson, The Engraved work of J.M.W. 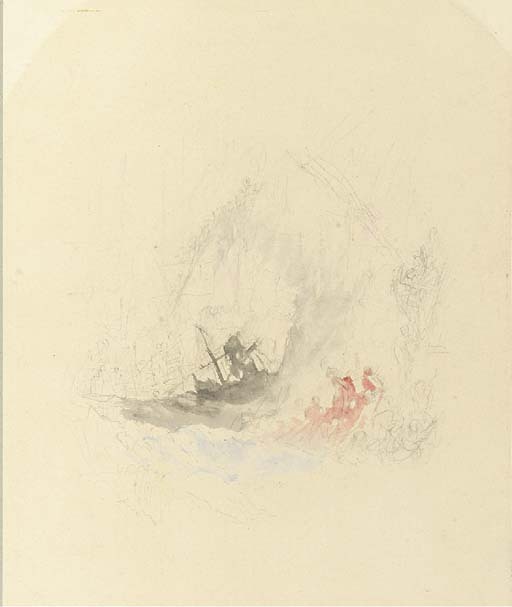 Turner, R.A., 2 vols. London, 1908, no. 334). For the engraving see J. Piggott, Turner's Vignettes, London, 1993, no. 147. We are grateful to Dr Jan Piggott for his help in preparing this catalogue entry.